Among other things, Warframe’s next big open world area will include giant enemy spider robots. Warframe will get two expansions over the next two years, developer Digital Extremes said this weekend. The first, called Fortuna, includes a new cyberpunk-themed open-world area on Venus and will arrive before the end of the year. The second, planned for 2019, is an entirely new mode, currently called “Codename: Railjack,” that will let teams of players crew warships in space in the vein of Sea of Thieves. The Fortuna expansion, which doesn’t yet have a release date, will be geared around Solaris United, a new faction of cyborgs that control the “Blade-Runner-esque” Debt Internment Colony on Venus. This is the underground hub area where players will be able to interact and trade the loot they’ve been collecting on the planet’s surface. The Orb Vallis—because Digital Extremes never passes up an opportunity to try and outdo Destiny’s maze of proper nouns—is what this open world surface area will be called. There, as in the current area Plains of Eidolon, players will be instanced with one another and allowed to freely roam around hunting for rare items, taking down monsters, and engaging with whatever other hostile alien forces are on the loose. In addition to new spider robot enemies and exotic animals, Orb Vallis will also have another awesome addition: hoverboards. But while Fortuna looks to build on ideas already introduced to the game last year, Codename: Railjack looks completely different from anything Warframe has done before and for that reason has me very excited. Digital Extremes, which showed off an 11-minute demo of the mode over the weekend at TennoCon 2018, the game’s annual convention, says up to four players will be able to group up, hop on a ship together, and then “fly seamlessly into space.” Each person onboard will have a unique role, like piloting the ship, controlling the laser turrets, or managing shields and repairs. The aim in this mode will apparently be to discover, board, and ultimately take control of various AI-controlled enemy ships. Once close enough, players can launch Archwings (bigger mech suits that go overtop of your Warframe mech suit) to get inside these vessels and complete objectives like they normally would on any other map. While each of the pieces looks familiar, the way Digital Extremes is trying to combine them for Railjack feels like an exciting new evolution for the game that’s all about movement and exploration. Revenant (left) and Garuda (right) are the two new suits being added to the game. Warframe has been an incredibly slow burn. When it launched in 2014 it was hard to tell apart from all the other free-to-play shooters being tossed out onto PC and console at the time. The game managed to find a small but committed player-base passionate enough to continue spending money on in-game purchases to keep it afloat while Digital Extremes continued to refine it. This culminated in last year’s graphical overhaul with the Chains of Harrow update, followed by the Plains of Eidolon in the fall. On Steam, the number of concurrent players finally broke 100,000 in September 2017 and as a result the game currently sits at number six on the Steam Charts. 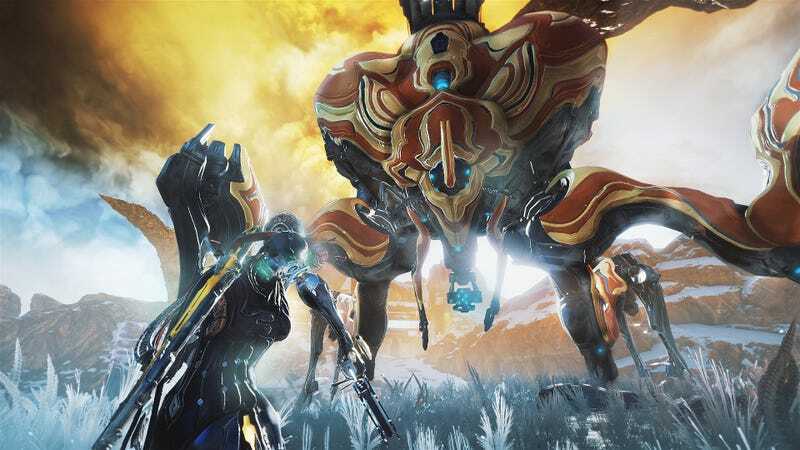 Also available on PS4 and Xbox One, Warframe will be coming to Switch in the undetermined future, the studio announced at the event. While stretching modest, piecemeal updates out over the course of several years isn’t ideal on paper, the game has benefited immensely from this extended timeline and lack of over the moon expectations. Rather than try to rush out Warframe 2, Digital Extremes’ has been able to continue adding new items, areas, and mission types to a base game just on the revenue it makes off its microtransaction economy alone. The result has been a game that has been allowed to mature at its own pace, while also allowing for interesting experiments. On Twitter, Steve Sinclair, the game’s director, confessed that Railjack was almost scrapped altogether. “15 days ago [the] entire RailJack section of the demo was going to be cut,” he wrote. “Broken, incomplete, flawed. But our team went all-in. I’ve wanted this type of gameplay since I was a boy. Solaris sing ‘we all lift together’ and I choke up because the song and it’s message became real for me.” It’s tough to tell from the demo alone whether Railjack will indeed achieve everything Sinclair wants, but for a four-year old game no one much paid attention to when it originally released, it’s exciting to see Warframe taking on such bold new challenges.